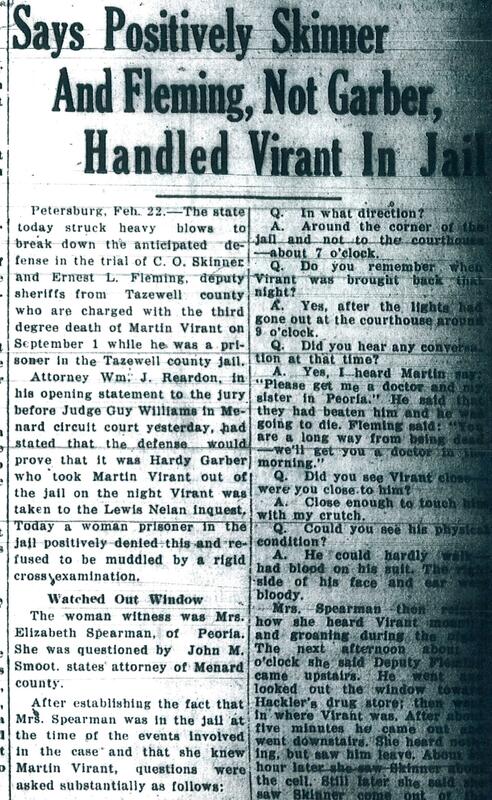 At 1:30 p.m. Monday, Sept. 12, 1932, the Tazewell County grand jury took up the case of the shocking murder of Martin Virant, whose dead body had been hanged in the Tazewell County Jail on Sept. 1 after he had succumbed to severe injuries he had suffered at the hands of county deputies while he was in their custody. Over the next five days, the grand jury would devote its attention solely to the Virant case. While the grand jury was in the midst of its proceedings behind closed doors at the Tazewell County Courthouse, the coroner’s inquest into Virant’s death also got under way nearby, at Kuecks Funeral Home on Capitol Street. Another thing that was unusual about the inquest is that it took place over two consecutive afternoons. 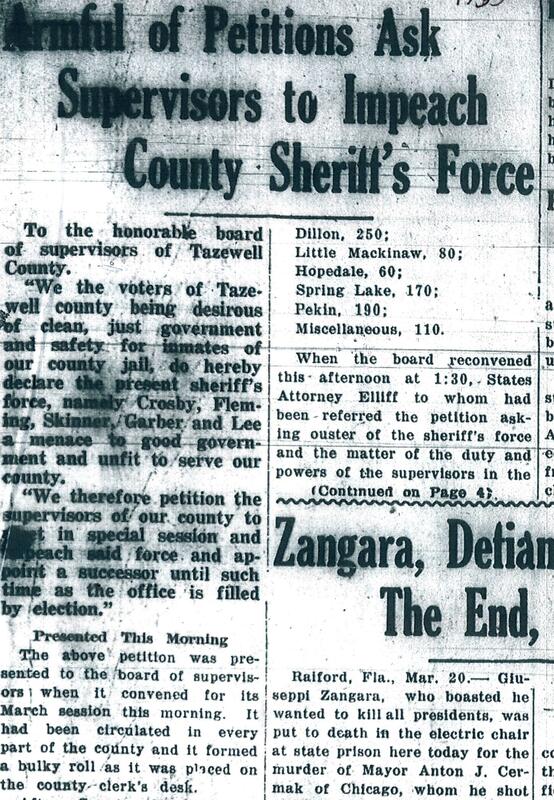 Tazewell County Coroner A. E. Allen summoned a long, solemn procession of witnesses to give testimony at the inquest. Many of the same witnesses also testified before the grand jury. The first witness at the inquest was East Peoria City Clerk E. W. Tucker, one of several people who had seen Virant on the day he was taken in for questioning by Deputy Charles O. Skinner and Deputy J. Hardy Garber. Tucker and other witnesses testified that Virant had no visible injuries before he was taken to the sheriff’s department. Another witness, Charles E. Schmidt, an East Peoria justice of the peace, said that he was told by Virant’s brother-in-law Frank Franko that “Martin had been in a happy spirit when he had left with the officers.” But Franko and his wife both told the coroner’s jury that Virant was worried that Skinner might do him harm. 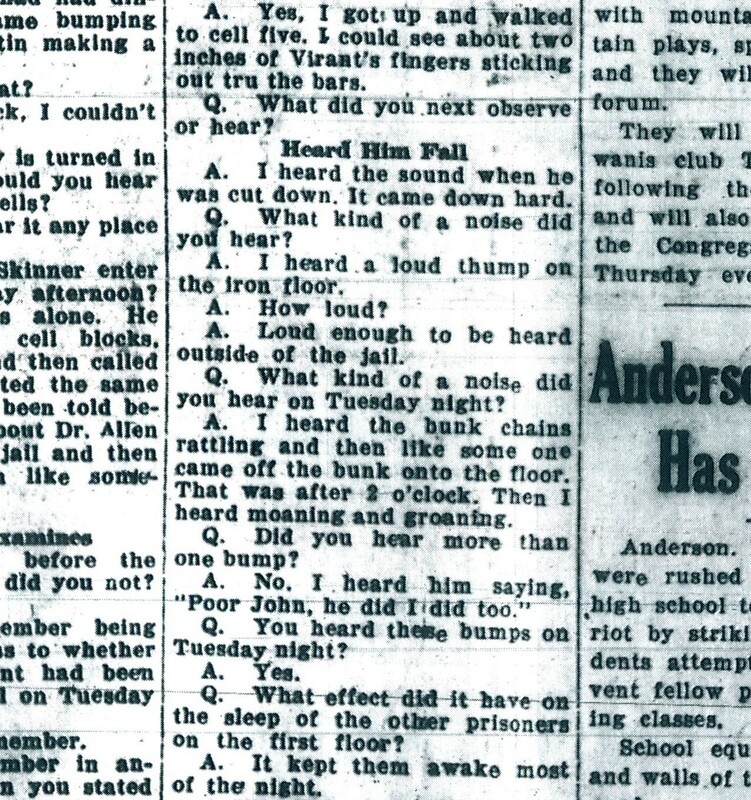 This detail from page 4 of the Thursday, Sept. 15, 1932 edition of the Pekin Daily Times shows some of the testimony of Martin Virant’s sister Agnes at the coroner’s inquest into Martin’s death. After Franko finished his testimony, his wife Agnes, Martin Virant’s sister, was called. She also said her brother was afraid that he would be beaten when the deputies took him to jail. 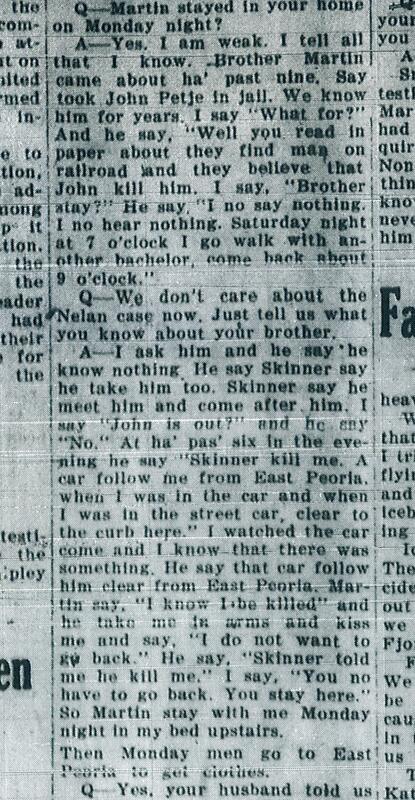 Even more, she claimed her brother told her just before he was taken to Pekin that Skinner had threatened to kill him. Next week: The coroner’s jury issues its verdict. 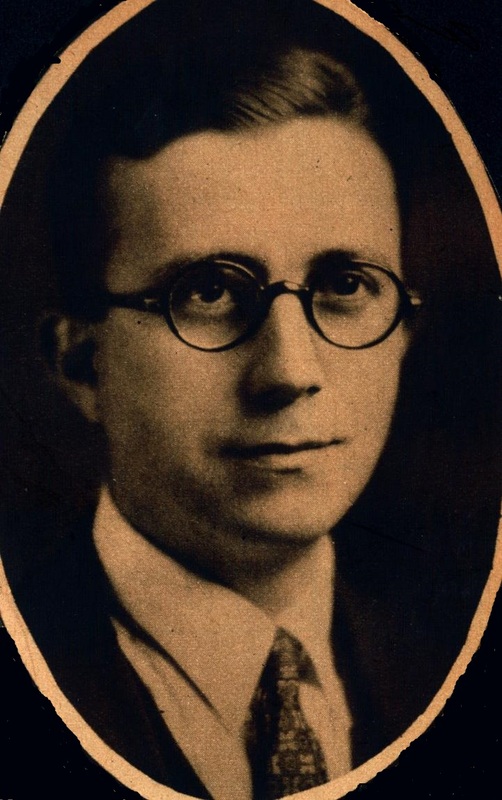 On Aug. 31, 1932, Tazewell County Coroner A. E. Allen held an inquest into the death of Lewis P. Nelan of East Peoria. At the inquest, the coroner’s jury heard testimony that on Aug. 27, Nelan had gone to the East Peoria speakeasy of John Petje, where he and Petje quarreled and fought. According to the testimony, Petje struck Nelan on the head with an iron bar, knocking him unconscious. Mistakenly believing that Nelan was dead, Petje and his companions, Edward Hufeld and George Genseal, placed Nelan on the tracks in the East Peoria railyards so Nelan would be run over and his death appear to be accidental. The facts of Nelan’s death were sensational enough – but those who attended his inquest were once more appalled and mortified by the testimony that they heard next. After the coroner’s jury was presented with the reports of the investigators and the testimony and confessions of Petje, Keayes, Hufeld and Genseal, Coroner Allen called Martin Virant of East Peoria to testify. Virant, a coal miner, was a lodger living above Petje’s speakeasy. Born Nov. 3, 1895, in the Austro-Hungarian Empire, the son of George and Rose Virant, he was an Austrian Army veteran of World War I but had become a U.S. citizen. He had a brother and a sister living in Peoria, as well as siblings in Europe. In a front page story about the Nelan inquest, the Sept. 1, 1932 Pekin Daily Times reported, “According to the testimony of Deputy Sheriff Fleming, Martin Virnt (sic), who was being detained by the sheriff’s office for questioning, was named by Genseal saying that Virnt was present at the time of the fight and was talking to him. “Virnt was brought from jail by deputy sheriffs, handcuffed. No warrant had been sworn out for him, but he was believed by the officers to have a knowledge of the fatal quarrel. . . .
“Virnt appeared nervous and disturbed and at this juncture Attorney J. P. St Verny (sic – St. Cerny), altho not retained by Virnt, asked the witness if he had been threatened, Vrnt (sic) replying that he had been. To learn why Virant “appeared nervous and disturbed” and who he said had threatened him, we will quote the transcript of Virant’s testimony that was published in full on the front page of the Sept. 6, 1932 Pekin Daily Times and the front page of the Sept. 17, 1932 Peoria Journal. Virant said, “I’m not afraid to die and I am not afraid to tell the truth. I fight four years in the trenches in the World war in the Austrian army and I see much and I not afraid to die. After the war there was nothing to do there so I decide to try here. But I got too much beating last night I tell you, they pretty nearly kill me! “Coroner Allen: Who beat you? “A – One officer and then another. “Q – Where were you when they beat you? “A – In the city hall in Pekin. I am not afraid to show the people. I look you in the eye and tell the truth. They push me, hit me in the head and slap me and I think they have broken two ribs. “They hit me on the ear (pointing to right ear which was swollen) they hit me on the head (showing blood on shirt). “Q – Did more than one beat you? “A – Yes, they beat and shoved me across the room, and Mr. Skinner (pointing to him) knocked me down and kicked me and stepped on my neck. “Q – What did they say to you? “A – Nobody said a word, no nothing. “Q – Did you fight the officers? “A – No. Somebody kick me and somebody slap me. “Q – They were trying to make you talk? Virant wanted to continue testifying about the torture he had endured at the hands of Deputy Charles O. Skinner and Deputy Ernest L. Fleming, but because Allen concluded that Virant knew nothing about Nelan’s murder, he sent Virant back to the county jail, expecting Sheriff James J. Crosby to release him. Skinner and Deputy Hardy Garber took Virant back to the jail, placing him in Cell 11. The next day, Virant was found dead in his cell – hanging by his own belt strap. Next week: A hanging in Cell 11 — Crime and Cover-up at the County Jail. 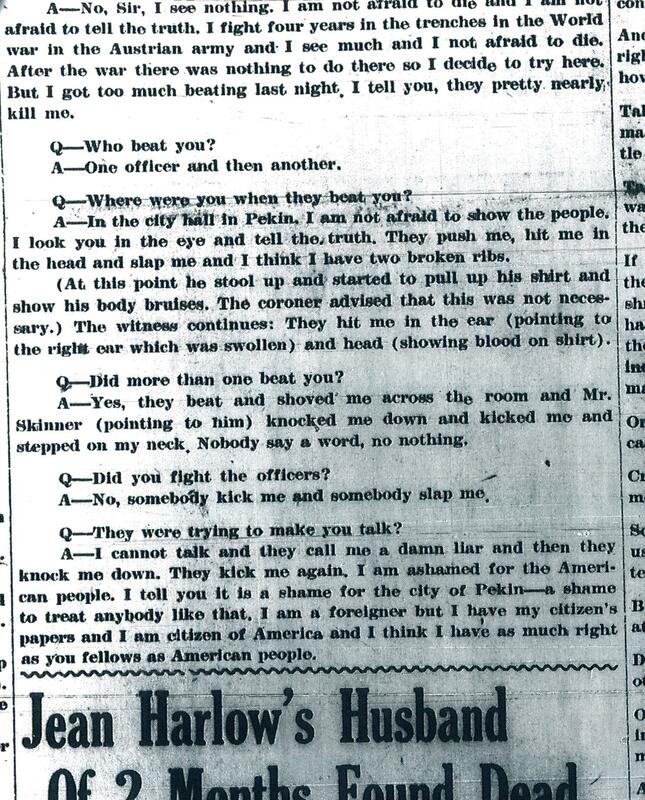 This excerpt from Martin Virant’s testimony at the inquest into the death of Lew Nelan was published in the Tuesday, Sept. 6, 1932 Pekin Daily Times.